Product prices and availability are accurate as of 2019-04-15 11:18:03 EDT and are subject to change. Any price and availability information displayed on http://www.amazon.com/ at the time of purchase will apply to the purchase of this product. This 4 Piece Carving Knife Set from Flexcut contains 4 knives in a convenient 4 pocket tool roll. The ergonomic handles let you carve longer without hand fatigue. The blades are honed, polished, and razor-sharp, right out of the package. 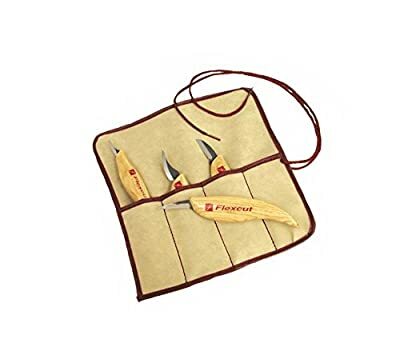 Set includes a Cutting Knife, a Detail Knife, a Pelican Knife, and a Mini-Pelican Knife. With their solid ash handles and high carbon steel blades, these carving knives are well built and ready to carve. This set is a great place for any aspiring knife carver to start.